Kantar company Lightspeed has promoted Jackie Blackler and Simon Buckley to serve as Co-Managing Directors, leading the firm's EMEA business from its offices in London. Blacker joined Lightspeed last September as VP Client Services. She worked as Global Media Director at Kantar Worldpanel, during an eighteen-year stay at the company, before moving to Kantar as Global Account Director. Buckley began his career at WPP-owned Millward Brown, before moving to Kantar Operations in 2004 as an Online Research Consultant, and then to Lightspeed in 2008 as VP, President, Client Development. In their new roles, the pair will have overall responsibility for operations, sales, marketing, leadership and development of Lightspeed across seven European offices. 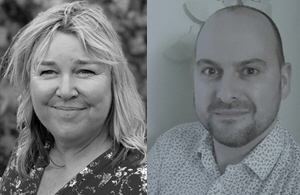 They report to Global CEO Caroline Frankum, who comments: 'Jackie and Simon have played integral roles in Lightspeed's growth, and share the same core values and goals to support the performance of EMEA. Their abilities and management styles complement each other perfectly, and have helped solidify our EMEA performance as best in class in our industry'. Please email drnpq@mrweb.com with any questions.